Lori speaks at adoption agencies to help clients understand how to create and sustain a vibrant and child-centered open adoption. She is also available to speak or keynote at adoption conferences. Inquire or arrange. We were so fortunate to have Lori Holden, author of The Open-Hearted Way to Open Adoption do a presentation for pre- and post-adoption clients at our agency. She is a dynamic and knowledgeable presenter with a passionate and compassionate view of the role of openness in adoption. I was particularly impressed by her ability to see all sides of the adoption triad, be realistic about such complicated relationships but also be optimistic and inspirational in her approach to creating the best possible outcomes for a healthy open adoption. She encouraged audience participation and was responsive and sensitive to all. If the proof is in the pudding, or the sale of the book is evidence of a great evening, we sold all of the books we ordered and the comments were extremely favorable. I would recommend Lori as a presenter to anyone involved in the adoption world. The Seattle Open Adoption &Family Services community was thrilled to welcome Lori on October 1st. Lori’s activities, personal stories, and grid analysis on four different styles of “openness” led to greater awareness and clarity as to what the adults truly need to do in relationships with children to both acknowledge and “heal the split between biology and biography.” Our community, already well versed in the benefits of openness and poised to enter a values-based open adoption, left the evening with even more wisdom and self-awareness courtesy of Lori’s candid style. Lori’s ability to reflect, use self-talk, and then act based on the best interests of her children left all feeling inspired and more equipped to reflect for themselves. Lori has an amazing ability to articulate the many nuances of open adoption and leaves space for others to ponder the difficulties without feeling judged. I would recommend her workshop to any community interested in fine-tuning their open adoption philosophy and the skill-set inherently needed to navigate a sometimes rocky, yet beautiful road. Many thanks to Lori for her Northwest visit! Months after attending Lori Holden’s workshop in Portland, OR, prospective adoptive parents at our agency continue to reference her teachings as a source of insight and courage in their open adoption journey. The family structure activity in particular, in which she asked people to embody the role of adoptive parent, birth parent, adoptee, and extended family, left a lasting impact. Through this exercise, our clients were able to consider what others in their adoption constellation might be experiencing. This level of empathy and Lori’s thoughtful way of guiding the exercise enhanced participants’ understanding and compassion towards one another. 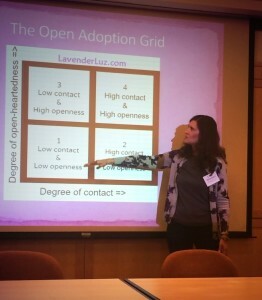 Additionally, Lori’s diagram portraying degrees of contact and open-heartedness has been referenced numerous times as something that was not only helpful, but empowering for adoptive parents as they step into the unknown aspects of their relationship. Lori’s workshop was a refreshing reminder for all of us that we are in control of our ability to be open-hearted. February: Guest speaker at the University of Denver’s Department of Communication Studies. April: Workshop at an adoption agency near Charlotte, NC. May: AFFCNY Conference in NY, Three Shifts Parents Must Make to Help Their Children Integrate Their Selves and Form Their Identity. August: Heritage Camps for Adoptive Families, Domestic Adoption Camp, How to Remain Open in Your Adoption Even When You Want to Shut Down. February: Guest speaking at the University of Denver’s Department of Communication Studies. April: American Adoption Conference workshop, Blazing Subtle Trails: Reforming through the Heart. June: Heritage Camps for Adoptive Families, China II Camp, How to “Do” Open Adoption When Birth Family is Not Available. 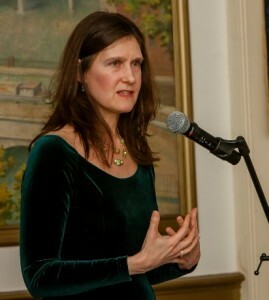 Lori is represented by the Linda Konner Literary Agency. Please inquire about speaking availability.